It's Housecleaning Week...still! Seems like a really long week to me! :) If you're just getting here - go get all the details from Monday's post and enter my giveaway of Purex laundry sheets! So, you want to know my progress and you're anxiously awaiting your assignments? OK, OK! MY progress on yesterday's project: Yet another project not complete! But it's OK - really! I got about half my cabinet organized and it's looking so much better. I really think if I assign myself all the same projects next week - they'll all get completed. I find this is going better for me than devoting all my time for 2-3 days on only 1 project (and getting sick of it). MY project for today: Organize the spare room closet. YOUR assignment #1: Find 10 toys and/or games to donate or throw away. YOUR assignment #2: Update your calendar for the next 2 months w/ appointments, birthdays, school stuff, sports practices, etc. It's been a while since I've thrown a few random thoughts your way - I know you've missed them so - LOL! ~ Our family has really been enjoying watching DVDs of Little House on the Prairie TV episodes. We borrowed them from a friend (we're on season 2 right now). My husband and I have very fond memories of watching the show as children and my son is enjoying the adventures. He is just as upset with Nellie and Willie as we were! It's so nice and refreshing to watch a show where the people actually pray and read from the Bible. That does not mean that we agree with everything they say or do on the show, but it is far better than anything on TV these days! ~ A young friend of mine just got a writing gig at Examiner.com! She already has a couple of articles there and her job is writing about Budget Fashion. She is trying to find jobs to save up money to go on a group Europe trip next year. This job will earn money according to site traffic, etc. Will you help a gal out and at least click over to help her page out? Her article on haircuts is right on! Thank you my friends! ~ It's my son's 10th birthday tomorrow and that's freaking me out a little. It really does go so fast! We're having a small party that will involve bowling, cake, and fun! Then we'll head out to dinner at his choice of restaurant (looks like it will be a breakfast place - he loves breakfast for dinner!) and have some strawberry pie later. Yum! Happy Birthday Eve my son! ~ I'm sure I had a few more random thoughts, but they've all swirled together now and I can't make any sense of them! Be sure to stop by tomorrow for a Housecleaning update and Dessert Friday! Link up any chocolate post or any dessert post - whether or not it has chocolate! 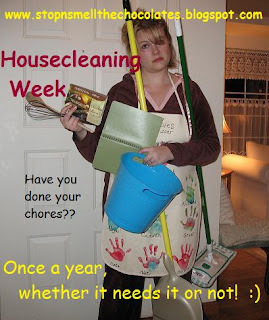 Sounds like you're doing great with Housecleaning Week! I'm not keeping up with my to-do list for the week, but I'm trying! My next job is to pull weeds in the garden and pick all the veggies that are ready. This is so awesome! I am so sorry I am just now joining you - it's been busy with vacation and getting the now blog up (whew!). You know I love you my friend!! The toys I really need to go through!! With all my mom's appointments, I have to stay on top of my calendar.